So the Diocesan Parish Annual Appeal (aka DPAA) is underway!!! 2 weeks ago we watched the dvd from Bishop Foys and last week Deacon Larry gave an awesome talk about the Playground for our students. Our DPAA goal this year is $101,700. All of that money goes to help fund very important programs throughout our Diocese – things like food kitchens and medicine for the poor and foster care – and many others. And as we saw from the dvd, that money helps real people with real problems. I’m very proud of how we always step-up to help those less fortunate than us. As you may know, any amount we raise over our goal comes right back to us for use in our parish. This year the money we raise over our goal will go to providing a playground for our students. This project is near and dear to my heart.J One of my great joys as pastor is ministering to our students – I spend a great deal of time with them. I love to eat lunch with them – the conversations we have are absolutely priceless and always put a smile on my face!! Most of the Catholic elementary schools around us already have a playground – so now it’s time to provide a playground for our little ones – they’ll be so happy!! But I need your help!!! We need to go about $50,000 over our goal to pay for the playground. Please be generous with your DPAA donation this year!!! If you pay with a credit card or through electronic funds transfer, the Diocese has changed the procedure when giving to the DPAA. 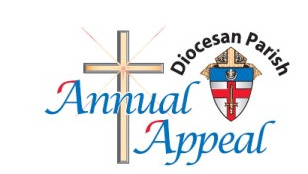 Go to the Diocesan website at www.covdio.org and scroll down until you see ‘Diocesan Parish Annual Appeal’ – click on the ‘Donate’ button and follow the instructions. If you don’t have a computer, stop by the parish office and we’ll walk you through it. If you need help with the process, please call our office (525-6909) and Jenny or Lori will help you out. I often get this question, “Fr. Kevin, how is the date of Easter determined?” That’s a good question – I’m glad you asked. In the 4th century at the Council of Nicaea, the Church decided that Easter should be celebrated on the first Sunday after the first full moon of spring. So that’s why the date of Easter changes from year to year. This Monday, March 19, you can take a break from your Lenten sacrifice for a day. The reason is because Monday is the Feast day of St. Joseph – it’s a solemnity, which means it’s a really important feast day (although not a Holy Day of obligation) – and it’s a happy and joyful day, not a day for penance. So if ya gave up chocolate for Lent – go ahead and indulge on Monday!!! We only have one Fish Fry left and so far it’s been a record-setting year!!! Our Fish Fry truly is an epic and special event and the reason is because of YOU – our volunteers. So a GREAT BIG SHOUT-OUT OF THANKS to EVERYONE who has helped with the Fish Fry!!!! If you’d like to volunteer, you’ve still got next Friday – so give us a hand!! Check out the following website for the many different ways to volunteer – http://signup.com/go/mhzZjQh. The best time of the year is here – March Madness!!!! The Madness is well underway and I’m sure there have been some huge upsets. How about those Xavier Musketeers – a #1 seed!!! Here are my Final Four picks…..UC, Villanova, Xavier, and Kansas. It’ll be an all-Big East final – Xavier will beat Villanova and cut down the nets as the champions!!! !